A robust "ring of steel" estimated to cost in the region of £5 million GBP has been proposed to protect the skyscrapers of London's famous and highly revered "Square Mile" from an impending terrorist attack. The methodology proposes manned checkpoints, rising street bollards and crash-proof barricades in addition to other more subtle security measures. This new development is in line with advice provided from MI5, as well as the counter-terrorism police in the UK. A recent Corporation of London report pointed towards this critical area of London, as being highly sensitive to a hostile vehicle-borne security threat, hence additional security protections were called for. Such advice comes about in the background of numerous terror attacks across European cities in recent times and the ring of steel is believed to be the best way to protect the heart of London's financial district. 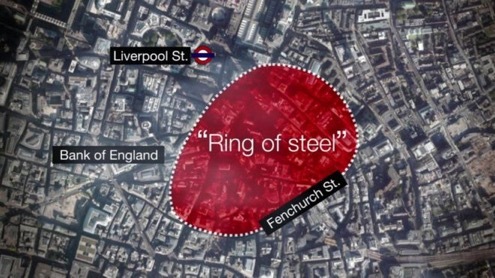 London's first ring of steel was a response to IRA bombs in the Baltic Exchange in Bishopsgate in 1992. Hence if the new measures are introduced, it would be the first time since the late 1990s that manned checkpoints were used. Such checkpoints were phased out after the IRA announced a ceasefire in 1994. The new protective ring will border Liverpool Street, the Bank of England and Fenchurch Street - an area which is home to some of the capital's newest and most recognizable skyscrapers. The report highlighted that the eastern section of the City of London is of special importance as a number of major landmarks around the area could be target for terrorists. The new plan will likely be subject to a consultation, however it could be fully implemented by as soon as 2022.